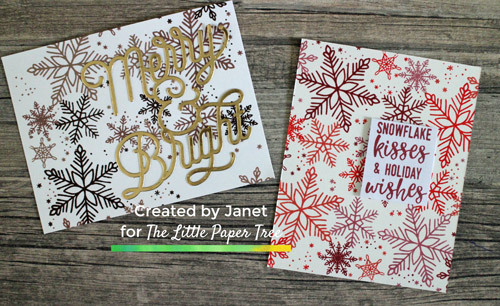 Hello, Janet here with two Christmas Cards. I love snowflakes! but wanted to show that they can be used in any colours you wish. I used the Snowflake Turnabout stamp by Concord and 9th along with Catherine Pooler Designs inks. All the supplies I used are listed and linked below. I’d love to see the Christmas Cards you’ve been making. Feel free to share them in our Facebook Group. Jeni made the X marks on the back of the stamp following the directions on the back of the packaging. This stamp was still in the Tim Holtz Stamp Platform from when Jeni made these cards. I worked on a pre-scored card base, using a small piece of purple tape to keep the card closed and some temporary tape runner to hold the card to the jig. For the neutral coloured snowflakes I used three colours of ink, and only turned my card three times. The colours I used are Icing On The Cake for the first turn, Sand Castle for the second, and Over Coffee for the third. I turned my jig 90 degree each time. For the sentiment I diecut the Merry and Bright die from Gold Metallic card and used little dots of liquid glue to adhere this to my card. I worked on mixed media card for the red card. I stamped in the same way using Peppermint Scrub, Samba, Polished and Rose Petals. I stamped my sentiment with Peppermint Scrub onto some white card, trimmed it into a rectangle and used foam tape to adhere it to the panel. I adhered this onto a A2 sized card base and my quick cards are finished. I decided not to add any other embellishments to my cards but you could easier add sequins or enamel Crystal Drops. Let me know what you think. Which one do you prefer? Did you see Milly’s first post?! She is such a sweet little furry granddaughter. And don’t forget to check out what the Design Team have been making!